February | 2014 | Woxford Brewing Co.
My local homebrew club does bulk grain buys roughly twice a year. I’ve been participating in these events for the past few years. I learned my lesson about bulk in my first purchase. I still have massive amounts of Thomas Fawcett Medium Crystal and almost a full sack of Thomas Fawcett Chocolate. You just can’t go through that much specialty malt even with close to 25 brews a year. 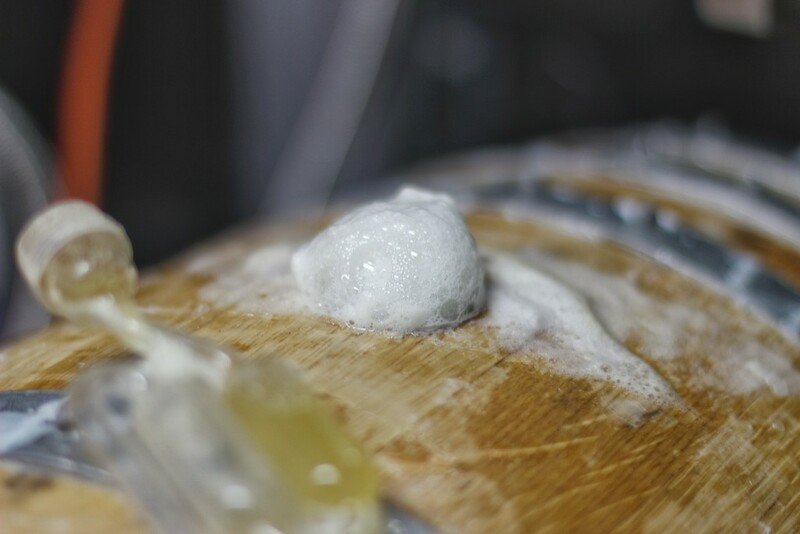 The past few times I’ve focused on getting better base grains; more continental pilsner, higher quality 2-row, etc. I’ve experimented with a number of SMaSH beers using Marris Otter, Munich and Vienna to help go throw the grains. Last year, the bulk buy started to get really hard. The supplier first quit allowing direct payments from homebrewers so the orders were grouped into larger sets and a handful of folks would pay for multiple homebrewers. Then they would only take a single payer. That was a bit awkward. Who wanted to front 12,000 USD? Luckily we’re all good friends and someone did pay-up and the rest of us paypal’ed our balance. And finally this year, the supplier no longer sells at all to homebrewers, only breweries. The good news is that a number of the club members have connections with the local breweries and Rogness Brewing right here in Pflugerville agreed to proxy the purchase. While all of this negotiation was going on something great happened. 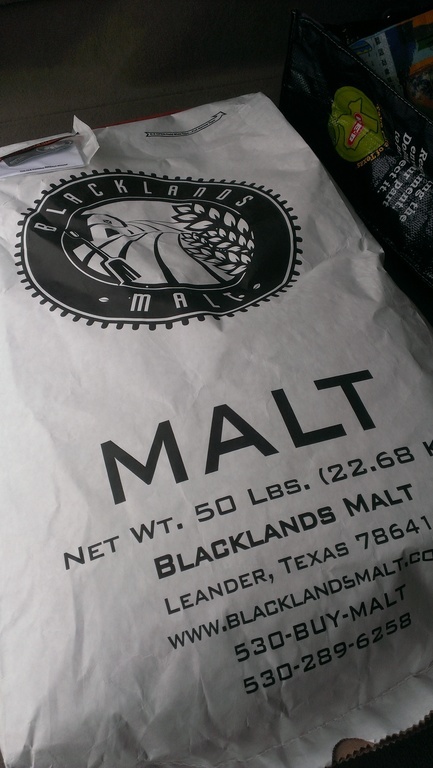 A local malting house opened up in Cedar Park, Texas; Blacklands Malt. The announcement was back in December and all of the inventory was immediately picked up, mostly by local breweries like Jester King, Pinthouse Pizza, Hops and Grain, and Black Star Coop. Around the end of January when the bulk buy was happening, Blacklands announced they still had Pale Moon, a 2-row pale barley in stock. I jumped at the chance to get a sack. I met Brandon at his malt house and got to see the whole operation. I’m excited to give Pale Moon a go in this lighter Pale Ale/IPA. Next month he’ll have his Pilsner available and I’ll be brewing version 4 of my Rekkae saison with local Pils. Not bad. For the recipe, I’ve been entirely inspired by the awesomeness of Pinthouse Pizza’s Calma Muerta. Yeah, it’s called a session beer; which it is. And I don’t really care about the “movement” nor if it’s 3.8 or 4.2 or 4.5 ABV to “officially” be call “session”. What matters to me is that it’s easy to drink, flavorful and light. I’ve attempted a number of IPAs, but nothing this light, so I’m looking forward to seeing how to craft a smaller beer, keep it flavorful and not watery. On top of it all, I’m throwing in an experimental hop, #1210 that I picked up a while back from Farmhouse Brewing Supply. The description sounds full of awesome. Many homebrewers have wanderlust when it comes to recipes. With so many styles around, it’s really hard to just brew the same thing all of the time; though I do want to revisit recipes to improve upon them. I’ve never brewed a milk stout before; but when I decided that I would I knew that I wanted to start with a clone recipe of Left Hand Milk Stout. 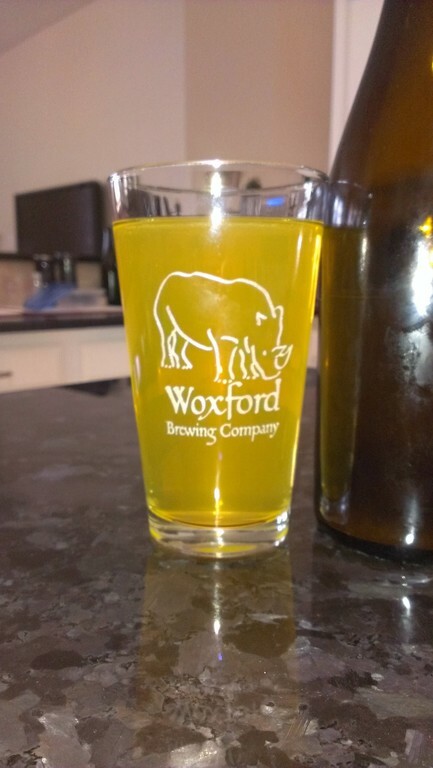 After a bit of searching, I found a thread on homebrewtalk with a starting point and then followed up by reading the BYO interview with the Left Hand brewer. After reading those, I pulled together my take on the recipe. The plan is to pull about a gallon of the finished beer and age it with some strawberries to make a Strawberry Milk Stout version that smells and tastes like it has strawberries. Ranger Creek brewstillery produces a wonderful beer in this style, but the presence of strawberry is something under dispute between my friends. Vacca Forte will have the strawberries one way or another. Enjoy! After about 24 hours since pitching, there was activity in the air lock. In 48 hours it had turned into a foam over. I replaced the liquid once in the airlock only for it to foam up again. Instead of fighting it, I just opened it up to the world. The aroma coming out of the barrel was amazing. It smelled funky and full of oak tannis. 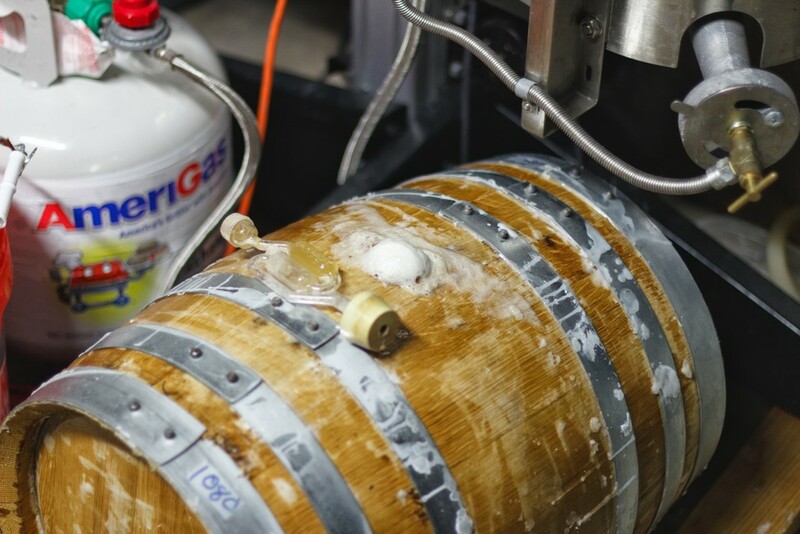 I spent a lot of time smelling the bung of this barrel. I immediately wished I had 10 barrels of this stuff. I left the air lock off for roughly a week. We had a cold spell down here in Texas and my garage was an usually cool 40F. I decided that I should use a heat belt next to the barrel to keep the temperature close 60F. That way I wouldn’t stall the active fermentation. After 2 weeks fermenting in the garage, pulled sample and it’s down to about 1.010 S.G. I’ve now moved the barrel into the house and it’ll stay at 70F for years to come.